"It is past midnight in the home of the newlywed couple. The husband has returned from a night out and collapses in a chair. His dog sniffs suspiciously at a woman’s cap in his pocket. The wife has not been idle either. 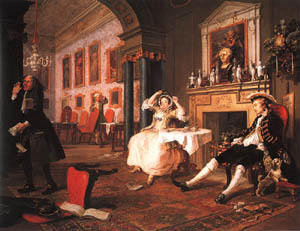 The cards on the floor and the booklet “Hoyle on Whist” indicate an earlier card party. The steward laments the stack of unpaid bills that he carries." The Baroque style took place from the 1600's-1700's and uses easily interpreted detail to produce drama and tension. It started in Italy and spread to most of Europe. Baroque art was found in many Catholic churches because it could be used to communicate religious themes. Everyone in our group pretty much did an equal share of work. Kyle sketched the picture, we all painted it and Jo did a lot of the presentation but we all helped. If I were to do this project again I would probably pick a different piece of art to draw and act out because our piece was hard to fit everyone in the video especially since I was supposed to be in the distance. There was a lot of detail in our painting too so I think a simpler painting would be easier.